As a reformed Magic the Gathering addict, I thought I had escaped the clutches of collectible card games, or trading card games, or TCGs. These things are brutal on the wallet and, frankly, a person’s time. It’s not that I don’t like Magic the Gathering, Weiss Schwarz or digital TCGs like Hearthstone or Might & Magic: Duel of Champions. It’s just that I don’t have enough of either to really get into a TCG as it should be played in order to really enjoy it. But then at PAX Australia I saw boxes of newly minted Final Fantasy TCG game cards, and I just had to give it a whirl, out of love and respect for both TCGs and Final Fantasy. The game had literally only just been released in Australia when PAX rolled around, so there’s no way to tell if this will have any kind of long-term legs, but certainly based on the interest I saw at PAX there is the potential for this to become a major TCG franchise. It’s supported by some rock-solid mechanics, too, that are easy to digest but complex to master. I picked up a couple of the starter decks (Final Fantasy XIII and Final Fantasy X), and I was also impressed with how well these cards capture the principles of the games. So the basic idea of Final Fantasy TCG is much the same as it is with all TCGs; you have to deploy a force of cards, and then use them to attack your opponent. You might end up attacking your opponent’s cards, in which case the stronger of the two cards gets to win, or you might slip through “unblocked” - perhaps because the opponent has run out of defences or doesn’t want to risk losing important defenders - and in that case, the opponent directly takes one point of damage. The first player to take seven points of damage loses. The game is accompanied with a single sheet of rules, which gets you up and playing (and understanding) the game in no time whatsoever. I have to emphasise how impressed I was by this, actually; if there’s a more fundamentally accessible TCG out there I’ve never seen it. Most of them really need an experienced player to show newcomers the ropes, but this is one TCG that I am sure players of all skills will be able to comfortably teach themselves. 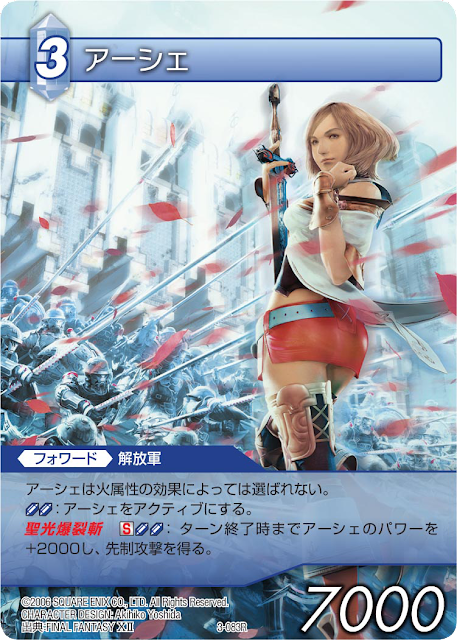 What also impressed me was the way that cards fed off one another in such a way that makes sense to the Final Fantasy franchise. 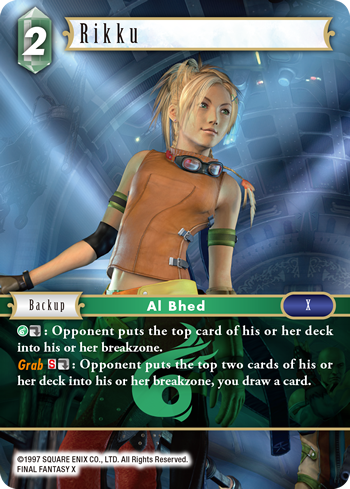 In the Final Fantasy X deck, Yuna, Rikku and Paine are at their most effective when they’re all on the table at once; a simple nod to Final Fantasy X-2, but an effective one in capturing the spirit of camaraderie that was central to that game. Meanwhile, the Final Fantasy XIII deck provides boosts to Noel when Serah’s also on the table, and Lightning is by far the most impressive solo fighter that I’ve seen in the cards to date. Because I only have the base decks, and haven’t bought any boosters, I’m not sure what the deckbuilding and meta side of the game is like quite yet, but I find that TCGs with a focus on cards that “feed” off one another tend to make for highly strategic games that require players calculate probability and odds in crafting a balanced and effective deck. Decks must be 50 cards in size, but you can only have three repeats of a single card in a deck, so it’s a high risk strategy to build a deck around two specific types of cards serendipitously in your hand at the same time. I suspect that the stronger decks will actually feature a couple of different combinations and potential strategies, so that the player has a plan B and C to fall back on if the cards don’t come up in the ideal order. The flow of the game is quite fast, certainly faster than the drawn-out affairs I found Magic the Gathering and others could be. The art of each card, pulled straight from the games, is gorgeous, though you could argue that some of the cards could have done with something like Yoshitaka Amano’s character designs (some do have these arts, but not nearly enough), rather than the in-game screenshots; but then this is a card game that blatantly intends to tap into the veteran fan’s sense of nostalgia. The actual stock that the cards are printed on is superb, feeling both thick and robust in the hand. What drives the success of a TCG is, ultimately, whether it develops enough of a community to enable widespread gameplay, and that there’s enough support in terms of new cards to keep things interesting (without coming up with new rules to break the game in the process). 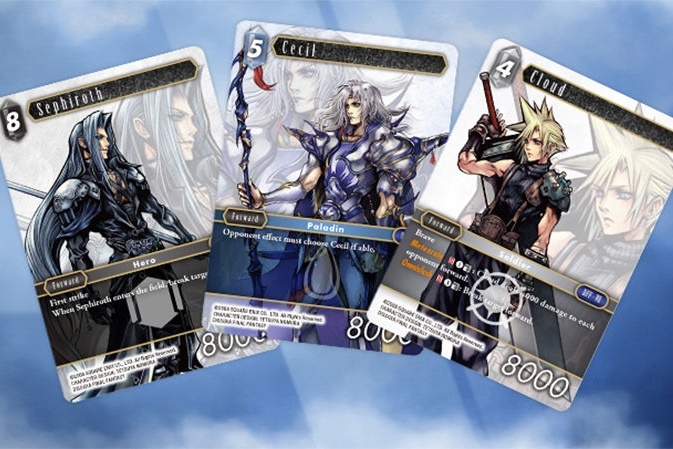 The Final Fantasy TCG is off to a really, really good start. It’s a game for fans of Final Fantasy first, and that accessibility, coupled with the tight mechanics and intriguing promise of deckbuilding strategy, means I give this an odds-on chance to find a permanent community.